The 'Middle Earth Roleplaying Project' aims to recreate J.R.R. 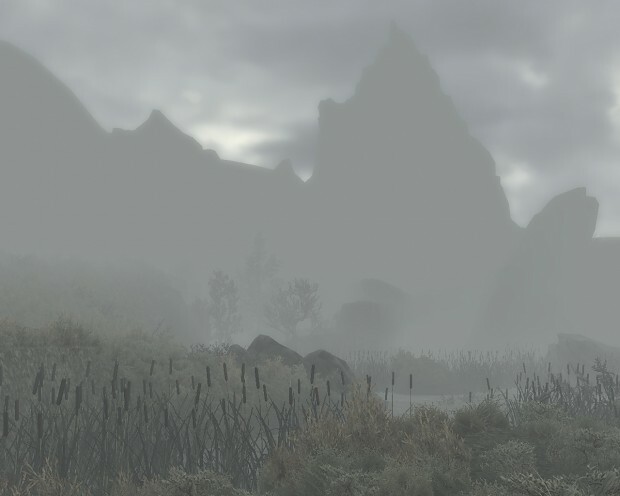 Tolkien's Middle Earth in the Creation engine of 'Skyrim'. The player will be plunged into Middle Earth near the end of the Third Age, not long before the War of the Ring breaks out. The rocks in the background are from the Emyn Muil. This is *exactly* how I imagined it. Wow, the Emyn Muil looks pretty jagged indeed. Will we find stagnant pools and such when traveling more to the center of the Marshes? For running water is perfectly understandable at the edge of the Marshes, but I can remember that the water in an earlier screenshot was quite disturbed too (this one: Moddb.com), while that shot was taken in a more central area than this screen it seems. Yeah, the water on that screenshot has been already overworked. What you can see on the screenshots here is actually the new water, however, it's with a running water mesh so it looks a bit otherwise. In the central dead marshes, the water will be nearly not moving. Speaking about water, will you be using the WATER mod for rivers, lakes? This.Is.Amazing. It's exactly how I pictured it. Keep up the amazingly fantastic work guys. Good effects and textures too! There will be lights, but they are only in the central part of the marshes, so you cannot see them on this screenshots which are from the northern border. Finally, you'd not really need to avoid the lights, if you tap into a pool, the dead faces will pull you down. Ugh, it's been over a month since the last update! The wait is killing me! I think this project has been stopped, a game company sent them a cease and desist letter if I remember rightly. I an completely aware of that. Look at the date I posted that. They received the Cease and Desist on the 29th I believe. Great atmosphere. Not so sure about the super-spiky peak in the background, though, it looks a bit unrealistic. When this will be avalible for download? Are you seriously that oblivious to what is going on? It's the front page of the mod! oh sorry lad, i read it after make the comment, foolish of mine. Are you guys still working on it? Created by Unbekannter, reeds by ztree.